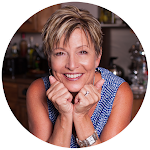 I'm posting this at the request of someone very special ~ and also for all those who've gathered around our table during the holidays who've enjoyed my (Mr. C's) famous Oyster Stew. I "borrowed" this tradition way back when the boys were away from home at college, and whom often arrived very late at night when traveling home for the holidays. I wanted to have something special for them, something warm and wonderful and delicate when they walked through the door, something that filled the house with a wonderful aroma of Mama's love -- comfort food at it's finest. 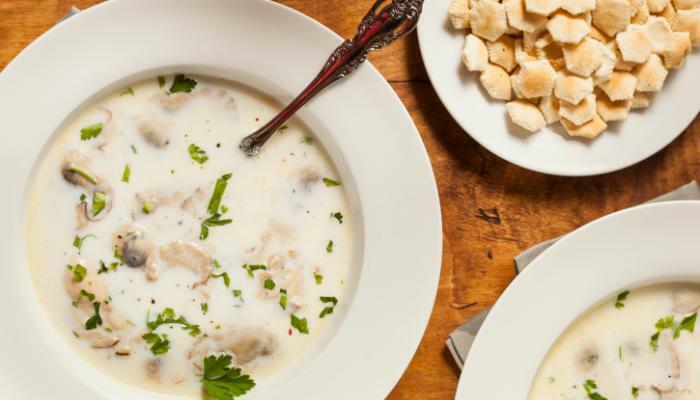 Thus was born the tradition of Oyster Stew -- both for Thanksgiving Eve and again at our seafood feast at Christmas time -- because it's just that good! It's super-simple; it's fast; it's very elegant; and I owe it all to Mr. C. (Long before we were together, I might add). So now it's our combined tradition. I think that's pretty darn special. And my mouth is watering just thinking about it! Melt butter in saucepan and add drained oysters. Cook 3 minutes over moderate heat, until edges of oysters curl. Add remaining ingredients except paprika. Let heat almost to boiling point. Serve at once, topped w/a dash of paprika and a side of crusty bread -- and more butter. Or oyster crackers, if you're my Mr. C.
So says Betty Crocker. 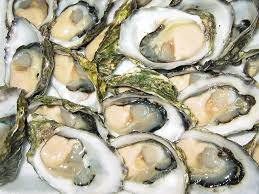 I always like more oyster "meat" than just oyster flavor, so I use at least 3 pints. But that and the celery salt are the only changes I make. You can top it with some scallions or parsley or red bell pepper if you're in the mood. I'm never feelin' quite that fancy. Experience Tip #1: Bigger is not better, in this case. Medium sized oysters are perfect. Smallish tend to get rubbery, and large ones are just too difficult to eat in a dish of broth. Experience Tip #2: Mr. C's improvement to Betty's recipe is to add a dash of celery salt in the serving bowl, also. Or if you're a Slap Ya' Mama fan thats good, too. Experience Tip #3: Sometimes I've used half & half instead of the milk & cream; however, sometimes this results in the broth "breaking", meaning it's too rich and starts to clot a bit. Not the best presentation. So you can play with the milk-to-cream ratio a little, if you want it richer -- but not too much. Experience Tip #4: This re-heats very nicely, and like most soups and stews, is even tastier the 2nd time around. So I double and triple the pot. That's just who I am. This sounds very good and the photos are such a help too.